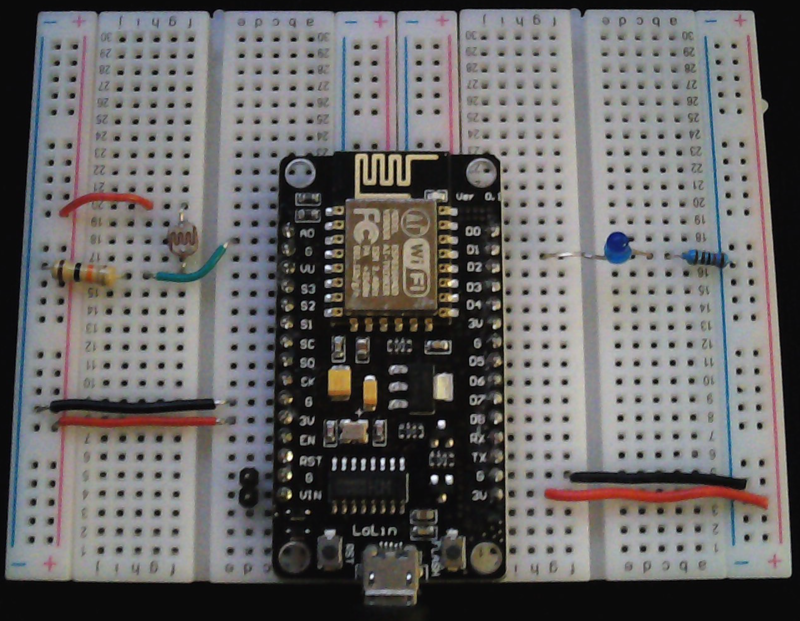 After testing the basic Wi-Fi connectivity options of the ESP8266 it is now time to explore some of the more interesting features of the chip. In the sketch below the NodeMCU development board creates a Wi-Fi access point and starts a web-server. 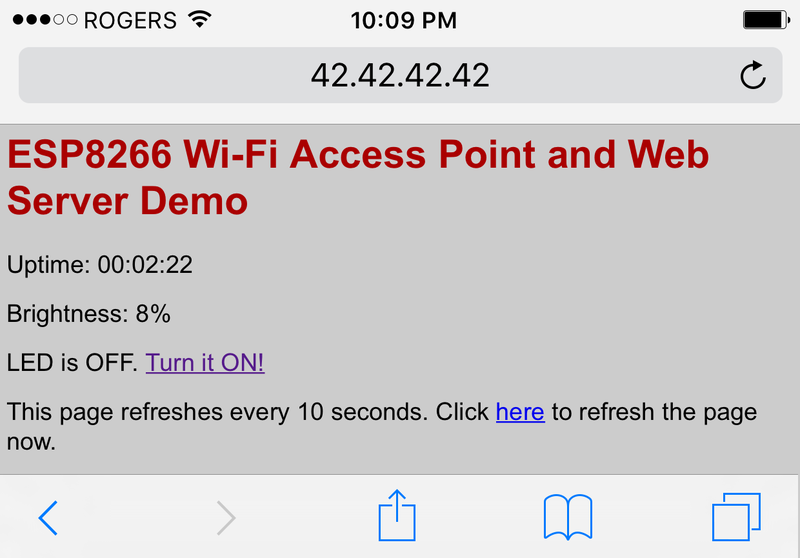 A HTML page hosted on the web-server displays analog data from a photocell and allows you to control remotely a LED via Wi-Fi from a web-browser on your phone or PC. As in the previous examples, I am using the Arduino IDE to program the ESP8266 board. The LED is connected to NodeMCU pin D1 (ESP8266 GPIO5) through a 1k resistor. One leg of the photocell is connected to 3.3v and the other one to ground trough a fixed 10k Ohm (or higher) resistor. There is also a connection from the NodeMCU pin A0 (ESP8266 ADC0) to the point between the fixed pull-down resistor and the variable photocell resistor. You can click on the link to toggle the LED now: the page should refresh and the LED should respond to your command! I’m starting to use ESP8266 and I’ve been very useful for your example thank you. I do not know HTML so I wonder if, once connected to the module, I can set ssid and password in the memory of the module itself by introducing this data into the edited web page. Great tutorial, code worked first time. Thanks! I love people that say Great and work first time; however I found it will not compile reason being in line 1 @ the end ” */” as you have it at line 3, because of that line 2 does not compile. Is it just junk when you reset the 8266 noise configuring registers etc. I haven’t manage yet to get the led to blink either way round but I must say this is lovely work by yourself. It gives an insight to what I want to do. Many thanks but please delete that */ and its perfect. Chrome rejects http://42.42.42.42 and brings up a search page. Works fine with firefox. The page does not automatically refresh. In fact it goes and stays blank when one toggles the LED and one needs to “manually” refresh the page. I am getting this error: “missing terminating ” character” at line 133 “,. I’m fairly new at this although I do know HTML5. I would like to use this sketch with the Adafruit Feather Huzzah with ESP8266. However, I’m not sure what changes need to be done to make it compatible. Any advice? At last I manage to change annoyed 192.168.4.1! I’m not getting the http://42.42.42.42 you mentioned. Great tutorial, worked first time. Thank you. Thanks for your help. I uploaded the above code and created an access point with web server on it successfully. Now, if I want to send some commands remotely via WiFi, e.g. sending commands or data from my distant laptop/phone to the arduino/ESP8266 in order to control the sensors, what should I do?